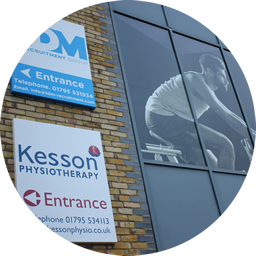 The Kesson Physiotherapy Clinic and Fitness Studio are located at 2 Jubilee Way, off Whitstable Road in Faversham. We have four dedicated car parking spaces and 2 x disabled parking bays adjacent to our building. Additional parking is available in the overflow car park and throughout the business park. There is step free access to our building. Take either the lift or the stairs from the lobby to the first floor. Appointments are by arrangement, including early morning and evening appointments outside of normal office hours. Kesson Physiotherapy is located at 2 Jubilee Way on the Euro Centre Business Park, off Whitstable Road in Faversham. If driving out of Faversham on the Whitstable Road, turn right after the Recreation Ground, at the Queen Elizabeth II Jubilee Centre. If driving into Faversham turn left into Jubilee way at the Queen Elizabeth II Jubilee Centre. Number 2 Jubilee Way is the second building on the right, adjoining De Gelsey House. Parking is available immediately outside 2 Jubilee Way, in the overflow car park and throughout he Business Park. Kesson Physiotherapy is a 10 minute walk from Faversham Train Station. Come out of the main station entrance and cross the road using the zebra crossing. Turn right along Station Road. At the mini roundabout turn left along Newton Road. At the traffic lights at the bottom of Newton Road, turn right onto East Street. At the Recreation Ground this road becomes Whitstable Road. Turn right once you reach the Queen Elizabeth II Jubilee Centre. Walk past the Jubilee Centre car park then De Gelsey House. Opposite the Good Shed you will see 2 Jubilee Way. The main entrance is a the front of the building facing the car park.